In late 2014, a group of medical doctors in Norway faced the challenge of managing Ebola patients on the field. 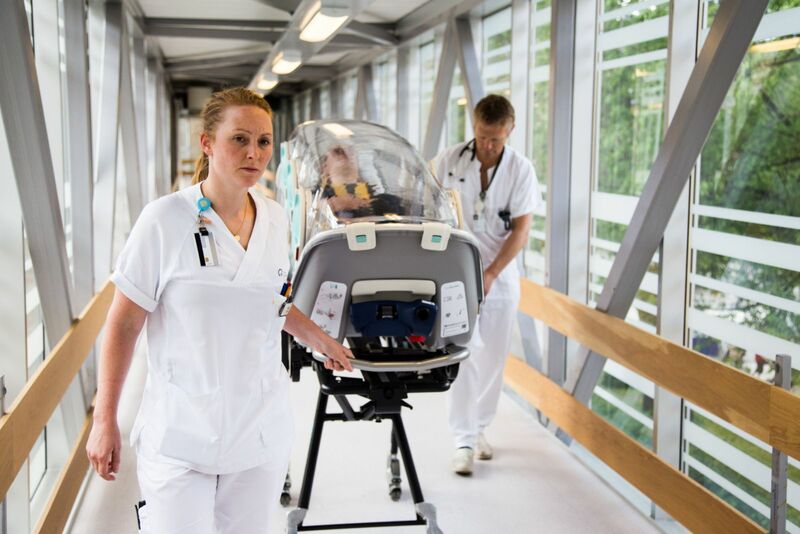 During their work, they realized that existing equipment available on the market made it virtually impossible to safely and comfortably transport patients with highly contagious diseases. This experience fresh in mind, EpiGuard was founded in 2015 with the purpose to become the market leader in the field of high-end special isolation units (SIU). After three years of hard work and millions of Euros in capital investment, the company recently launched their first product: the EpiShuttle. The product represents a leap forward in the state of the art: The novel ergonomic design permits execution of medical emergency procedures not possible with competing solutions. It has unique medical ports allowing all kinds of intensive care treatment of the patients through the barrier. It is the first polycarbonate hard top, hard base SIU improving safety for both patients and personnel. The device is also reusable, reducing costs and limiting the amount of contagious waste to be disposed of. The ergonomic design makes it more comfortable for the patient with adjustable inner stretcher and a less claustrophobic transparent dome. The group of doctors that established EpiGuard have first-hand experience in providing advanced treatment, transportation and management of patients with highly infectious diseases, e.g. Ebola. Indeed, the team has extensive clinical and scientific experience, with over 100 original scientific papers in high-impact journals; as well as significant collaboration with TOP international institutions. EpiGuard is co-founded by a team of award-winning designers and engineers, and the EpiShuttle has already been awarded the Chinese DIA silver design award and the Norwegian DOGA design award. The EpiShuttle is disrupting a market dominated by single use devices not optimally designed for treatment, safety or comfort for the patient. Key features have been developed together with users to enhance sustainability and lower the risks of global epidemic spreads through areas like; reusability, on-site intensive care treatment, EMS system combability, quick patient loading time and being able to set the device for both positive and negative pressure modes. The EpiShuttle is CE-marked and approved as a Class 1 medical device in Europe. It has undergone rigorous testing – including crash, vibration, and rapid decompression – to ensure compliance with CEN 1789 and that it can be used for transportation in ambulances, planes, and helicopters. The EpiShuttle is a one-person SIU, designed to give complete protection from contagious diseases, without compromising advanced treatment and care to the patient. The risk of cross-contamination is effectively reduced by the design of an innovative rigid, transparent top and a rigid base fitted with a gasket. A battery powered blower creates negative air pressure, while filters ensure that air going in and coming out of the EpiShuttle is safe. The transparent hardtop withstands accidental perforation and leakage, provides easy communication with the patient, while reducing panic and claustrophobia. The rigid concave base prevents any leakage of body fluids from the isolator. The device works as a special stretcher, but the base has generic fixing adapters to most kinds of commercially available undercarriage for ambulance stretchers. For comfort, the stretcher has adjustable back- and leg rest. Health care personnel are dependent on easy access to the patient´s head and face, as well as having good visual contact with the patient. At the head-end of the EpiShuttle, glove-ports are placed at a 40 degree angle to enable outstanding access to the patient. The treating physician´s head and eyes come close to the head of the patient, with an unobstructed view to his/her airways. This permits a full intensive care treatment with intubation, bag-valve mask ventilation, suction from the airways and central vein catheterization. It is crucial to facilitate the routine workflow of health care personnel, while allowing them to use equipment they are accustomed to; we have therefore designed a channel for the ventilator hose towards the patient´s head so that all kinds of ventilator hoses can be used with a standard HEPA filter on the expiration air. Advanced medical monitoring and treatment is made possible through generic medical ports, sealing off whatever equipment the personnel want to use without any special equipment or connections. The glove ports have generic design enabling other types of equipment to be connected to the port. 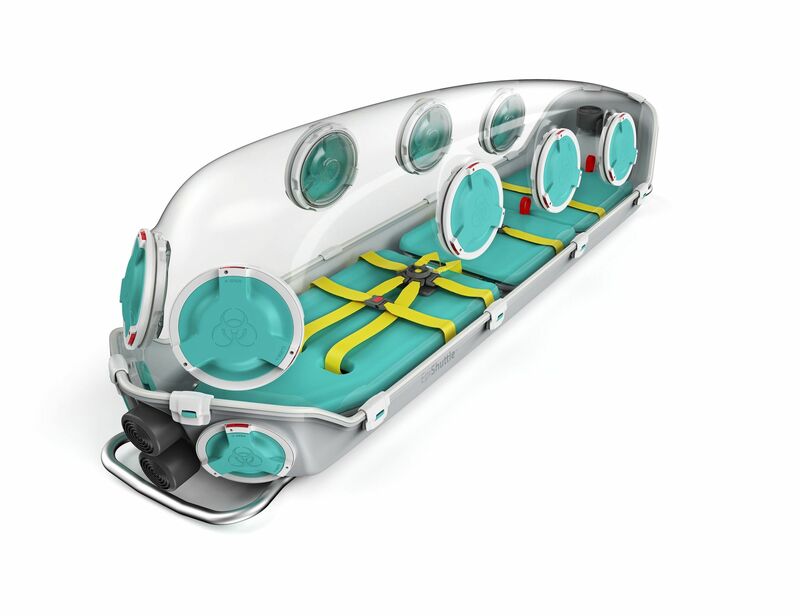 The integrated sluice (air-lock) allows equipment, medication or other items to be sluiced into EpiShuttle without exposing the environment to the biological threat inside. With repeated disinfection of the sluice, it can be used several times during the transport. Waste can safely be disposed outside the patient compartment using specialized waste bag, and all equipment attached to the glove-ports can be hot-swapped during use without contaminating the surroundings. Reprocessing (reuse) of the device is tested, both with regards to tolerance of the disinfectant and regarding the cleaning and disinfection validation. All parts of EpiShuttle can be completely and easily dismounted for cleaning and disinfection without the use of tools, and reprocessing is done by the user. The tested process is a soak/immersion disinfection with peracetic acid, widely recommended for a broad range of microbes. As the first of its kind, the EpiShuttle can therefore be used multiple uses. The EpiShuttle is compatible with most mechanical ventilator circuits. Using negative pressure and P3 filter, the isolator provides full environmental protection from particulate cross-contamination of highly infectious diseases. In positive pressure mode, the isolator protects patients from hazardous environmental agents through the use of CBRN filters. The design allows for full intensive care treatment and emergency procedures, such as intubation and insertion of central venous catheters. Since launch a few months ago, the EpiShuttle has been delivered to university hospitals, police special forces, militaries, and NGO’s responding to the latest Ebola outbreak in the Democratic Republic of Congo. If you are interested in more information about the EpiShuttle or EpiGuard, we welcome potential customers, partners, and distributors to contact us on sales@epiguard.com.